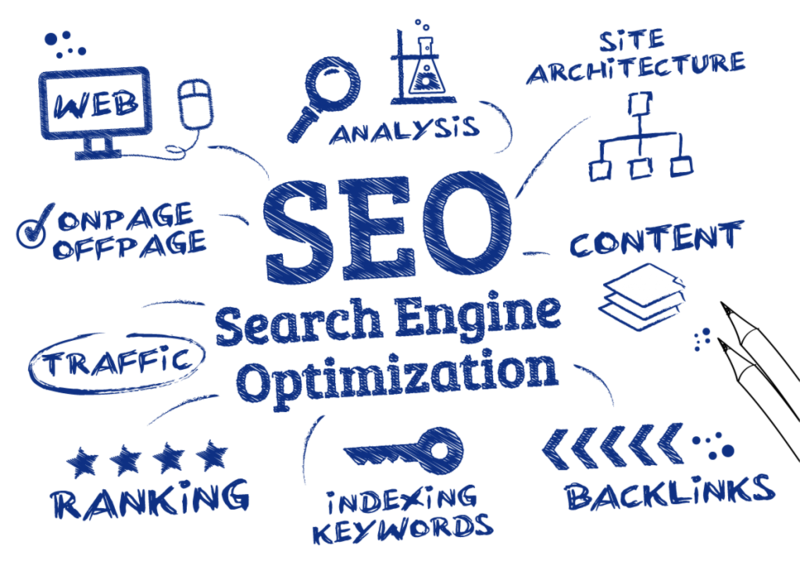 SEO stands for “Search Engine Optimization” and can be defined as the art and science of optimizing your website to generate and increase quality traffic through organic or natural searches. Search engines, such as Google, have developed their own algorithms and guidelines for SEO specialists to follow and practice. Google continues to be the leading search engine with over 63% of the search market share in 2018. Given that Google is the leading search engine, we will focus exclusively on that platform which boasts over 200 ranking factors. Simply put Google bots crawl pages of your website to properly index the information to relevant search queries. Having original and expanded content displayed with proper titles, headings, and meta tags will benefit your site’s SEO performance. It’s best practice to have a content strategy with proper keywords to constantly schedule, develop, and publish content on a regular basis. There is no secret formula for one to crack the top spot on Google, but there are best practices to follow. Most businesses purely judge a SEO campaign success on #1 rankings. Where it is great to be #1 position for your favorite keyword, is it the keyword or key phrase your customer will be using in their search query? Customer intent is key, and there are tools available to measure search query volumes and search trends. An SEO specialist will be able to research the right keywords for a campaign to select “achievable” keywords based on your website’s authority score, keyword difficulty probability metrics, and keyword competition scales. The goal is to build an SEO campaign on easier keywords aka “the low hanging fruit” giving your website a boost to obtain those more difficult keywords. Is SEO All The Same? The rules and guidelines are the same for everyone, but all SEO is not the same. Search Engine Optimization can be classified in two segments; On-Page and Off-Page. The answer is unknown. Every industry and every market is different. It’s not uncommon for a website to take 6 months minimum to start to see a shift/increase in their online presence with some competitive industries such as law, insurance, or real-estate taking closer to 12 months. Google dictates the links on the SERP and algorithm updates are made daily. Yes, daily. These updates may not always be a core update which drastically changes the playing field, but they should not be ignored as it can give you an advantage over a competitor who fails to adapt. One of the key ingredients for any SEO campaign is time. The reason being it is a constant process of adapting, measuring, and benchmarking. Despite being a leading power in Artificial Intelligence (AI) system, Google is indexing hundreds of billions of web pages or well over 100,000,000 gigabytes of data. Any given website is just tiny sand pebble on a giant beach, but your website doesn’t have to be buried in the sand forever. Both are respectable digital marketing options, but aren’t necessarily on the same playing field. Where SEO is focused on organic listings, Pay-Per-Click (PPC) is a bidding system for the paid ad positions on a SERP. While each can be benefit a small business; there are three main differences that are worth noting; cost, positioning, and time. Cost: PPC can have a flexible cost because it’s a bidding platform, where budgets can be set by the account owner. However, the average cost per click (CPC) can drastically vary by industry. Since the cost is pay for every click, CPCs of $25 can rack up a budget rather quickly compared to SEO which is more likely to be a fixed monthly rate. Positioning: Google Ads place their paying advertisers in premiere locations of the SERP; however the ad will clearly be labeled as an “ad”. SEO cannot guarantee a premiere location or even a first page listing; but organic search tends to produce more quality traffic. Time: SEO is always on, PPC may not. What if you have a $15 daily budget for ads and exhaust your budget early on in the day? Sure the $15 over 30 days, or $450 budget, sounded feasible when the campaign started, but having to potentially shut down your online presence by noon every day can be a problem..
Social media is one of over 200 Google ranking factors. It’s not a measurement of having the most posts, but offering engaging content. Are your social media profiles claimed? Are you building a following? Are people liking your posts? Is your site bringing traffic from social media? Is your brand awareness leading to “branded” searches? Google preaches user experience, provide them a pathway to your site through multiple outlets of the internet. Voice search and the rise of smart devices will continue to change the perception of SEO, but the future is unknown. The only guarantee of SEO in the future will be what we do today is going to be different 6 months from now, as what we did 6 months ago is much different to the tactics down today. New features are released and existing features are always updated. SEO is ever evolving, and it’s easy to be left behind. At any time Google can release core algorithm update which can rattle the SERPs. Pricing SEO can is difficult because no two websites, industries, or markets are the same. Some SEO agencies are guilty of creating SEO Packages, taking the “one fit for all” approach, but it’s ineffective in mapping a positive ROI. The cost depends on a few key factors; geographical target, competition, and campaign objectives. An hourly or one time cost can curtail you website to be SEO friendly with the proper markup and tags. However, a monthly retainer is most common for the purposes of site monitoring, implementing new to market features, and benchmarking success. The risk is the same as walking a neverending tightrope. One may be able to balance down the rope for awhile as the effect may not be imminent when ending an SEO campaign, as it may prove to be fruitful for the following months. However, Google notices when a site hasn’t been updated or stops producing content. Traffic and referral sources may start to spiral down which will then cause one to lose balance and fall off the tightrope. There are plenty resources available to learn everything about SEO from simple meta descriptions to complicated schema markup. SEO is not a set it and forget service and requires constant monitoring and tweaking; which is why small businesses should hire an SEO agency. A typical business owner does not have the time to set aside to learn the practice. Save time and frustration by hiring the right SEO agency with the right expertise to executive a campaign that brings your business leads. Big Surf Media provides quality SEO services and strategies customized for your business. Unsure if SEO right for you? Request a free SEO Audit to gauge your online presence.